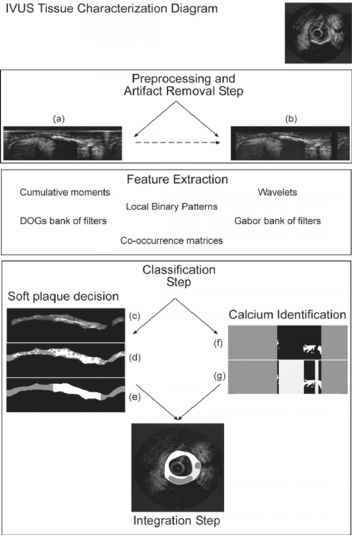 Figure 2.19: Plaque segmentation (see text). Figure 2.20: Tissue characterization diagram. in three stages: First, the soft-hard classification (Figs. 2.20(d) and 2.20(e)), in which the soft plaque, the hard plaque, and calcium are separated. In the second stage, the calcium is separated from the hard plaque (Figs. 2.20(f) and 2.20(g)). 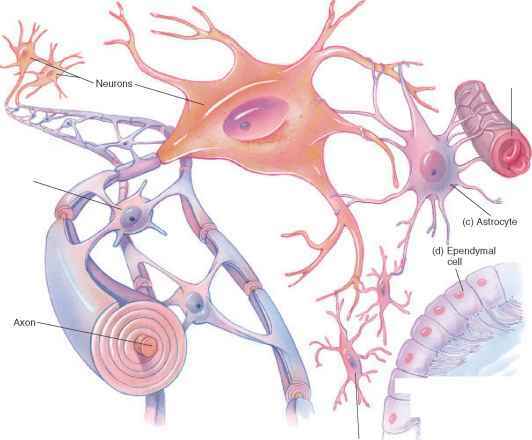 At the last stage, the information is fused and the characterization is completed. We will refer later to this diagram to explain some parts of the process. Recall that the plaque is the area comprised between the intima and the adventitia. With both borders located we can focus on the tissue of that area. For such task, the three stages scheme formerly described is used. Regarding the first stage of the process, a classification is performed on the feature space. At this point, a feature space and a classifier must be selected. To help to choose which feature space and which classifier to use, we try each of the feature spaces with a general purpose classifier, the k-nearest neighbors method used as a ground truth classifier. Regardless the classifier used, the information provided at the output of the system is a pixel classification. Using these data we can further process the classification result incorporating region information from the classification process and obtain clear and smoother borders of the soft and the mixed plaques. Different processes can be applied to achieve this goal, two possible approaches are region-based area filtering and classification by density filtering. In a region-based area filtering the less significant regions in terms of size are removed from the classification. On the other hand, the other method relies on keeping the regions that have high density of classification responses. As the classification exclusively aims to distinguish between soft and hard plaque, a separate process is added to separate hard plaque from calcium. Once soft and hard plaque are distinguished, we proceed to identify what part of the hard plaque corresponds to calcium. One can argue why not to include a third class in the previous classifier. The reason we prefer not to do so is because experts' identification of calcium plaques is performed by context. Experts use the shadowing produced by the absorbtion of the echoes, behind a high-echoreflective area, to label a certain area as calcium. In the same way, we take the same approach. On the other hand, the fact of including a third class only hinders the decision process and increases the classifier complexity. Therefore, the calcium identification process is made by finding the shadowing areas behind hard plaque. Those areas are easily identified because the soft-hard classification also provides this information (Fig. 2.20) since shadowing areas are classified as nontissue. We can see a plausible way of finding calcified areas. Figure 2.20(f) shows the classification result under the adventitia border of the "hard" tissue. Dark gray level areas are regions with soft plaque and, therefore, do not provide information of the calcium composition of the plaque. We use one of the previous classified images, the soft-hard classification or the blood-plaque classification. In white, it is displayed the regions of tissue under the adventitia border in the area of interest. Figure 2.20(g) shows in light gray the areas of shadowing, and therefore, the areas labelled as calcium. To end the process, the last stage is devoted to recast the resulting classification to its original polar domain by means of a simple coordinate transformation. To evaluate the results, a classification of over 200 full-tissue regions from 20 different patients has been performed. The training set is a subset of two thirds of the overall data determined using the bootstrapping strategy. The rest of the data has been used as test set. Previously, different physicians have determined and delineated plaque regions in each full-tissue image. The first experiment is to set a ground truth for the feature spaces, as a measure to evaluate their description power. We have used k-nearest neighbors as a ground truth classifier. To choose the number of neighbors, we select a feature space and evaluate the performance for different values of k. Tables 2.2, 2.3 and 2.5 show the error rates for pixel classification (RAW Error) and postprocessed classification taking into account neighboring information and density of classifier cluster responses (Post Error). These tables also show the percentages of false positives (FP) and false negatives (FN) for both errors. The FP and FN are included as they give information of the possible geometry of samples in the feature space. 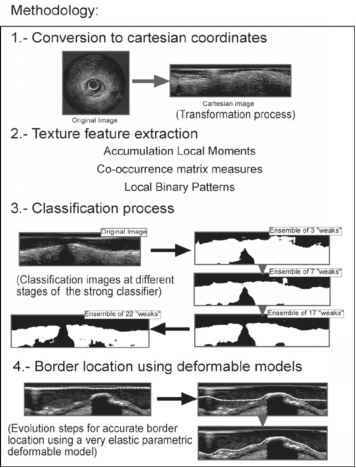 (g) (h) Figure 2.21: Tissue pixel classification data using 7-nearest neighbors method on different feature spaces. (a) Original image in cartesian coordinates. (b) Expert manual classification of tissue. (c) Co-occurrence feature space. (d) Gabor feature space. (e) Wavelets feature space. (f) Derivative of Gaussian feature space. (g) Accumulation local moments feature space. (h) Local binary patterns feature space. discussion we will only take the three best postprocessed data performing feature spaces: co-occurrence matrix measures, accumulation local moments, and local binary patterns. Up to this point we have neither taken into account complexity of the methods nor time issues. However, these are critical parameters in real applications, thus, we consider them in our following discussions. Once the feature space is selected, the next decision is to find the most suitable classifier taking into account our problem constraints, if any. We are concerned with speed issues, therefore, simple but powerful classifiers are required. Because the high dimensionality of two of the feature spaces selected (co-occurrence matrix measures have about 24 features per distance and accumulation local moments have 81 features) a dimensionality reduction step is desired. PCA is the first obvious choice, but because great amount of overlapping data the results are worse than using Fisher's linear discriminant analysis which is focalized in finding the most discriminative axes for our given set of data. The result of this experiment is shown in Table 2.5. We use maximum likelihood combined with a Fisher linear discriminant analysis reduction. As local binary patterns do not need dimensionality reduction due to the small amount of features computed (three features), the comparison with this method is done by just classifying with the ML method. As expected, the raw results are much worse with this kind of classifier. Co-occurrence matrix measures take the worse part doubling their error rate. However, local binary patterns, though they have also worse error rate with ML, manage to be the most discriminative of the three methods. This fact is also shown in the postprocessing, where local binary patterns still have the lower error ratio. Co-occurrence matrix measures regain their discrimination power after the postprocessing. Figure 2.22: Boosting procedure for tissue characterization at different stages of its progress. (a) Expected hand classification by an expert. (b) First stage of the boosting procedure. (c) Classification with a five classifiers ensemble. (d) Classification with 10 "weaks" ensemble. postprocessing and classification rates. In this case, the classification rate is over 92% with a classifier as fast as applying 10 times a threshold. Therefore, using accumulation local moments and boosting techniques we have another fast and highly accurate scheme for real-time or near-real-time tissue characterization. Up to this point, we have discussed the reliability of the soft plaque versus hard plaque discrimination process, which is our main concern, since the identification of calcium is reduced to the part of hard plaque with a large shadowing area. Using the method described in the former section, 99% of the calcium plaque is correctly identified. Figure 2.23 shows some results of the tissue characterization process. 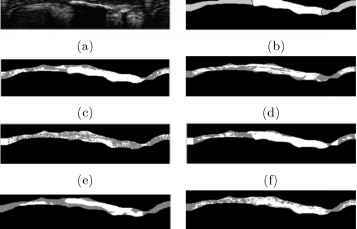 Figures 2.23(a) and 2.23(b) show the characterization of a soft plaque. In Figs. 2.23(c) and 2.23(d), there are two different kind of plaques detected, calcium (gray region) and soft plaque (white region). Figures 2.23(e) and 2.23(f) show the characterization of the three kind of plaques: fibrotic (light gray region), soft plaque (white region), and calcium (dark gray region).